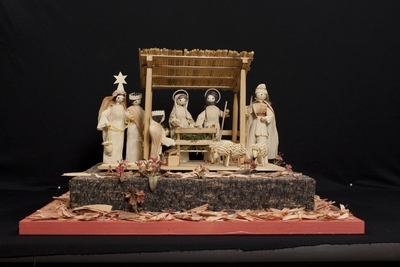 This nativity scene by Slovakian artist, Peter Palka, is an award-winning set (first prize) of the 1996 International Crèche Festival in Bellingham, WA. It was featured on the 1995 Slovakian Christmas stamp. What makes this Christmas representation attractive is its simple beauty. It is made of corn husk, and artistically worked in great detail. Given the difficulty to work with corn husk, the finished product is not only an artful creation but also a true labor of love. The latter, a labor of love, echoes the deeper meaning of the Incarnation. The spirit of Christmas is God's labor of love for humanity, its beginning and promise for more labor and more love. Handcrafted set of figures depicting the nativity of Jesus, created from wood, corn husk, straw, and reeds by Peter Palka in Slovakia. Exhibition label originally written by Fr. Johann G. Roten, S.M. for exhibit entitled "At The Manger" and held at Roesch Library, University of Dayton.